The morning of 4 May 1917, one hundred years ago today, coincided with an important event in the history of Queenstown, now Cobh. The news was not printed in British or American papers, yet in some mysterious way it reached nearly everybody in the town. A squadron of American destroyers, which had left Boston on the evening of 24 April had already been reported to the westward of Ireland and was due to reach Queenstown that morning. At almost the appointed hour, six warships came into view under the command of senior officer Commander Joseph K Taussig,. The American flag of the Stars and Stripes was decked on public buildings, on private houses and on nearly all the water craft of the harbour. This was the first contingent of the American Navy to arrive in Irish waters. Media sources for this significant event offer an insight into the faithful day of 4 May – not at that time due to secrecy – but certainly in the ensuing year 1918 as the American Navy relayed agreed positive narratives in East Coast North American newspapers and in speaking engagements at sites such as Carnegie Hall in New York. With the modern digital age, more and more of American newspapers have also been digitised and these offer the researcher wider lenses to study Cork’s role in a World War. In addition, the personal papers of Commander Joseph K Taussig are contained in the Naval Historical Collection Division of Washington DC. Published is the diary that Taussig kept during his time in command of the first US destroyers to arrive in the Atlantic war zone in 1917. Taussig’s flagship was the Wadsworth. The other vessels of the division and their commanding officers were the Conyhgham (Commander Alfred W Johnson), Porter (Lieutenant Commander Ward K Wortman), McDougal (Lieutenant-Commander Arthur P Fairfield), Davis (Lieutenant Commander Rufus Zogbaum), and the Wainwright (Lieutenant Commander Fred H Poteel). At the outbreak of the hostilities these vessels comprised the US’s Eighth Destroyer Division and were stationed at base no 2 in the York River in Virginia, USA. At 7pm on 6 April 1917, the day that the US Congress declared war on Germany, Commander Taussig received a signal from the Pennsylvania, the flag-ship of the Atlantic fleet – “mobilise for war in accordance with department’s confidential mobilisation plan of March 21”. By 14 April 1917, Commander Taussig received a message to take his flotilla to Boston and there fit out for “long and distant service”. Ten days later he sailed with instructions to go 50 miles west due east of Cape Cod and there open his sealed orders. At the indicated spot, Commander Taussig broke the seal and read the subject “Protection of Commerce near the coasts of Great Britain and Ireland”. The instruction signed by Josephus Daniels read, “Proceed to Queenstown, Ireland. Report too senior British officer present and thereafter co-operate fully with the British navy. Should it be decided that your force act in co-operation with the French naval forces your mission and method of co-operation under French admiralty authority remain unchanged…when within radio communication of the British naval force off Ireland, call G CK and inform the Vice-Admiral at Queenstown in British general code of your position, course and speed. You will be met outside of Queenstown. Base facilities will be provided by the British admiralty. Communicate your orders and operations to Rear Admiral Sims at London and be guided by such instructions as he may give. Make no reports of arrival to navy department direct”. It took ten days to make the trip across the Atlantic due to a south-east gale, which accompanied the ships for seven of the ten days. So rough was the sea that Taussig recalls in his memoirs that they could not set their mess tables and ate off their laps. On the ninth day off the south coast of Ireland, the fleet were met by a small British destroyer, the Mary Rose, who came along side flying a flag with “welcome to the American colours” on it. The small ship led the fleet past Daunt Rock lightship off Robert’s Cove where a tug boat was waiting on which was an official photographer sent from London, who took moving pictures of the division as they passed. They stopped just outside Roche’s Point, and a British naval officer came on board each destroyer to pilot them to their berths. Despite the secrecy, the news that the destroyers had reached Queenstown appeared in the German newspapers several days before. For the first time in many months, a German submarine laid a mine field of twelve mines directly off the entrance to Cork Harbour. British mine sweepers swept them up. The fleet berthed safely at the naval pier where the American Consul, Mr Wesley Frost, met them. There were several automobiles in waiting and they were whisked to the Consulate’s office. There Lord Mayor Thomas C Butterfield made a speech of welcome, where he laid stress on the close relations between the Irish and the American race. He was followed by the Resident Magistrate, Walter Callan. All the time proceedings were filmed by the London photographer. The American guests then proceeded to Admiralty House and reported to British Vice Admiral Sir Lewis Bayly to receive their orders. 893a. 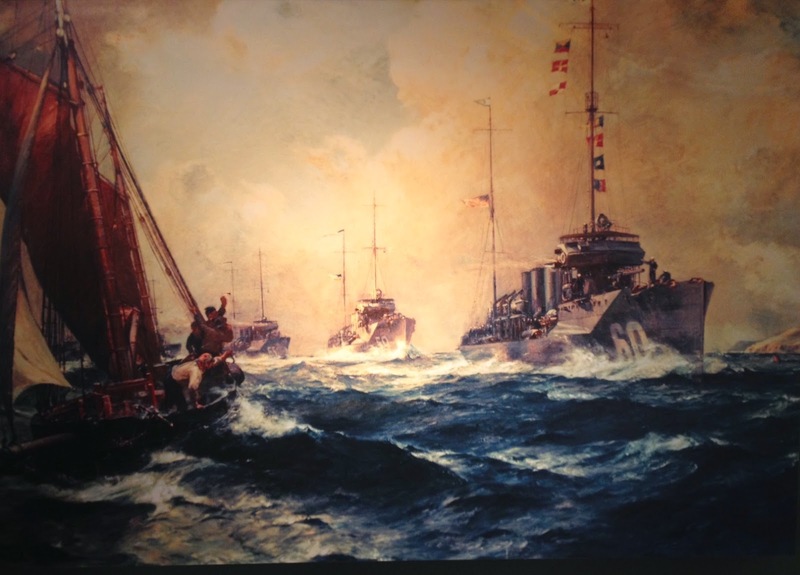 Bernard F. Gribble’s Painting, The Return of The Mayflower; Assistant Secretary of the Navy Franklin D Roosevelt commissioned the painting in 1919. In 1933, when Roosevelt became President of the United States, the painting hung in the oval office (source: Naval History and Heritage Command, Washington). 893b. 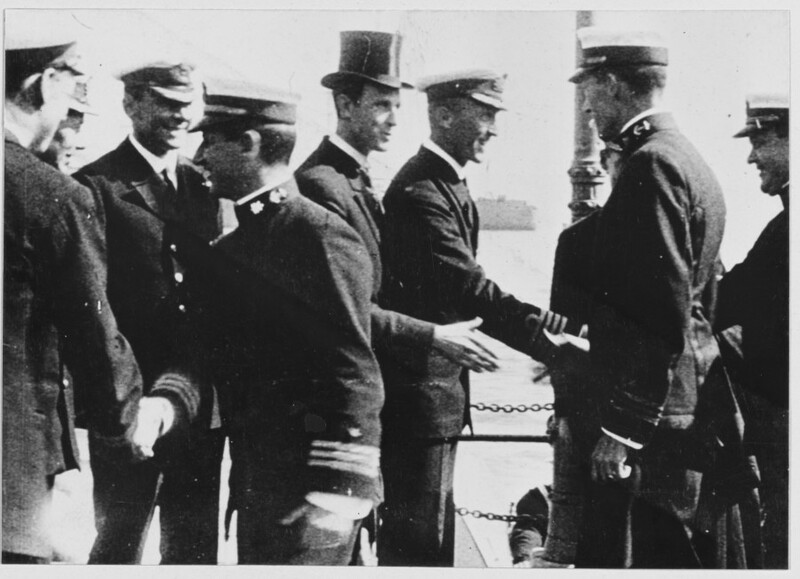 Mr Wesley Frost, American consul, and British Naval officers greeting Commander Taussig and the other officers of the destroyer flotilla upon their arrival in Queenstown, May 4, 1917 (source: Naval History and Heritage Command, Washington).